Recently, I came across an article written a few years ago about why scholars should or should not bother writing book reviews (Toor, 2012). The piece was targeted mainly at what the author called the “book heavy disciplines,” including the humanistic subjects of history, literature, politics, and anthropology, in which book reviews form an important part of the disciplinary discourse. Even before she plunged into the substance of her article, Toor provided a rapid-fire list of the standard reasons that scholars in the humanities and social sciences write book reviews. Because we are expected to do service to the profession. Because we are invested in our fields and want to be involved in a conversation about where they should go. Because it’s nice to get a free copy of a book that you are going to want to read anyway, and then be forced to think hard about it. Because […] flexing those brain muscles can be a useful experience. And because, for graduate students, a review can be a way to enter into the world of the grown-up academic, writing for a larger (if not large) readership. While not all these reasons apply to scientists, the passage got me thinking about whether or not scientists should bother with the exercise. The answer I believe is yes. Although books do not form an integral part of their daily work lives, or perhaps because they do not, there is a definite value for scientists to periodically engage in the exercise of reading and reviewing books about their field. The fact that leading scientific peer reviewed journals, such as Nature and Science, have book review sections (that are not peer reviewed) leads me to believe that I am on the right track with my recommendation. Perhaps it behooves me at this point to insert a note about my own biases. Being a book review editor for a scholarly journal in the history and philosophy of biology, my opinion is perhaps obvious. “It comes with the job description” as one might say. But, this opinion is not a result of my role. If anything, the opposite is true. Because of my experience as a reviews editor, I have come to realize the value of scientists writing such articles, both for the journal’s readers and for the scientific community. 1. First, the exercise of reviewing books will make you a better writer. I have said it before and will likely do so in future posts, that “Practice makes perfect.” I will also add that the more diversified the practice, the better. The format, style, tone, and of course, content of book reviews are quite different from those of original research papers; they tend to be more evaluative and perhaps even speculative in nature. By writing them you exercise your mind and writing talents––flex those brain muscles––in less familiar areas and develop a stronger foundation, not only of writing but also of critical thinking skills. 2. Book reviews are a great entry point into academic publishing. Unlike research articles, book reviews are not peer reviewed. So an invitation to write one means that barring some major transgression, you will definitely get published. Granted, the review will not count toward much in terms of publication credit for tenure. But, it is a great way to get your feet wet working with editors, getting a paper through to publication, and to build confidence in your writing. At the end of this article, I offer some brief advice on different venues to publish book reviews. 3. Reviewing books encourages you to read and be more well-informed. But textbooks, which are admittedly pitched to younger, less experienced audiences, are by no means the only types of books about science out there. The genres of books that I recommend that scientists should consider reviewing include popular science books about their own field as well as scholarly monographs on subjects such as the history of science or the social, philosophical, or economic implications of science. This sort of reading has the advantage of keeping scientists plugged into the wider world and to stay aware of the reception, implications, and impact of their work to the wider public. 4. Writing book reviews gives you a voice in a broader conversation about your discipline. Knowing what people think about or think they know about your field is only half of it. Book reviews give you a forum, if not for correcting something that you believe to be erroneous, then at least to present your point of view and to provide your arguments and evidence to a wider audience. This advantage may be implicit in some of the earlier points I have made, but it bears reiteration. It is a sad fact that communications between scholars in different fields, even within the same institution, is woefully lacking. Reading and reviewing books by your colleagues in other departments could serve a small but useful step in bridging such communication gaps. 6. 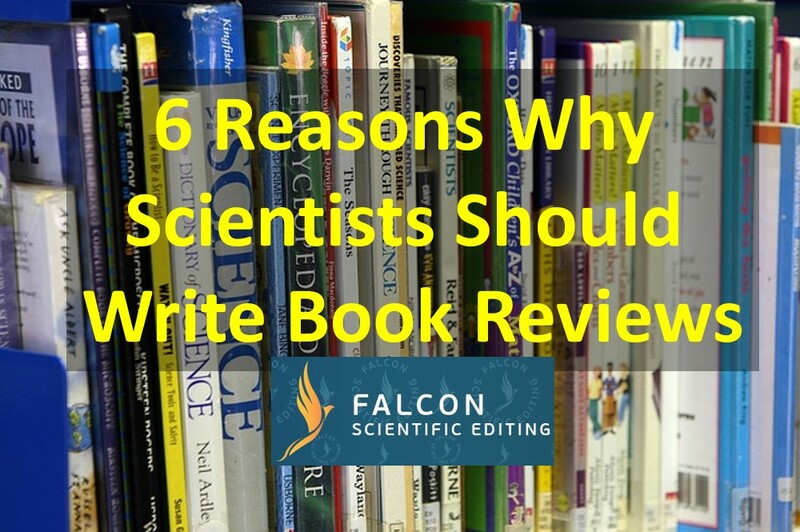 Book reviews are a way to encourage communication within a laboratory or department. In an earlier blog post about how heads of laboratories might promote good writing practices in their research groups, I offered some strategies, such as to have regular meetings to discuss recent scientific literature and to bring different genres of writing into the mix. Assigning a book to your research group and having the members of your group weigh in with their opinions is essentially teaching them how to write a book review, albeit co-authored. Whether or not such a review gets published is not the main objective. But if it does, kudos! Where should you publish your book review? There are many possible venues, and which one you choose depends on many factors. The most important considerations are the subject matter of the book itself and the forum in which you wish to have your voice heard. As mentioned earlier, both Nature and Science publish book reviews. Naturally, many books reviews are done by scientists, but often you will also see reviews of popular science books or scholarly books about such subjects as the history, philosophy, sociology or anthropology of science. Indeed, most academic peer reviewed journals have book reviews sections; the best way to find out is to flip through recent issues or to take a look at the editorial staff and see if there is a dedicated reviews editor. There is no need to restrict yourself to academic venues. All the big newspapers and magazines feature book reviews––Do the The New York Times or The New Yorker magazine sound familiar? Trade and professional publications, e.g., The Chronicle of Higher Education also have similar sections. Some of these publications even pay you to write reviews for them, although breaking into such gigs is admittedly more difficult that publishing book reviews for free (Confession: I haven’t found a way in yet). Once you have decided on where you would like to publish your review, I recommend that you write to a reviews editor and pitch a particular book rather than sending them a review upfront. Make a point of reading a few recently published reviews and be sure that the book would be of interest to the publication’s target demographic. Show the editors, instead of simply telling them, why a particular book should be reviewed by them, and more importatntly, why you are the right writer for the task. Perhaps the best news for would-be reviewers is that editors are often on the look-out for books as well as review authors. So, they usually welcome suggestions or offers. Even if the first contact does not result in immediate results––the book that you pitched may already be assigned for instance—once editors have your name on file, they (or should I say, we?) will contact you when the right opportunity arises. What do you think about writing book reviews? We welcome your feedback. Contact us and start a conversation! Shenai, J. (2000). The Art of the Book Review: Exploration of Health Science. Journal of Perinatology, 4, 211–212.